Humans are increasingly moving to urban areas, which in turn are expected to grow and become more densely populated. Wildlife also shares those spaces, which can help urban residents feel more connected to nature (and healthy). Ecologists recognize the need to study this environment amid growing awareness of the value of novel urban biodiversity. Scientists are producing a growing literature even about the urban ecology of bats and their insect prey. San Francisco represents a unique window into this future urban world. It’s the second most densely populated city in the US, and because it’s surrounded by ocean on three sides the effect of that density may be more pronounced for wildlife living there. 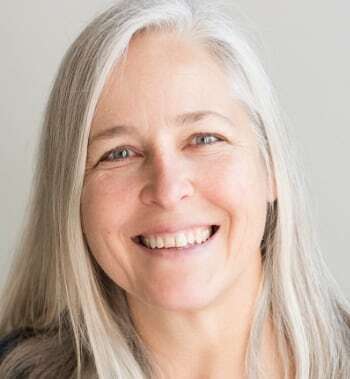 For my master’s degree at San Francisco State University in Dr. Gretchen LeBuhn’s lab, I looked at where and when bats used natural areas in the city for foraging to determine what bats were present in this extreme environment, and what factors were most important for them to find food. During 2008 and 2009 we used acoustic monitoring to compare bat activity in 21 different parks in different times of the year. We found bat activity in all locations sampled, predominately that of Brazilian free-tailed bats (Tadarida brasiliensis). Bats were active all year around as well. We confirmed the presence of at least four species of bat species, although there may be additional species especially during spring and autumn migration. In addition to the free-tails, we also found two species of Myotis bats, Yuma and little browns. Yuma myotis (Myotis yumanensis) are usually associated with water and we found them in parks that had lakes. We only found little brown bats (M. lucifugus) in two of those parks with lakes. Migratory red bats (Lasiurus blossevillii), like all the species, were found year-round. The best explanation for species richness was the proximity of fresh water to the site. Proximity to water also explained patterns in bat foraging activity, but park size and the amount of forest edge habitat nearby were also important. Many studies have shown that larger parks (or any “island” of good habitat) will have more diversity or activity, and our study confirms that this applies even in densely populated urban centers. Edge habitat is also frequently cited as important for wildlife, especially insect-eating bats. Insects often congregate along tree lines, which can function as a wind break, making foraging more efficient. And the confluence of different habitat types will increase insect diversity. Indeed, parks that had more forest edge habitat had more bat foraging activity. Finally, because the importance of native plants for wildlife is an important topic in San Francisco yet poorly understood in urban ecology, we also included that in our models as well. We recorded more Yuma bat activity in parks with a lower proportion of native plants. 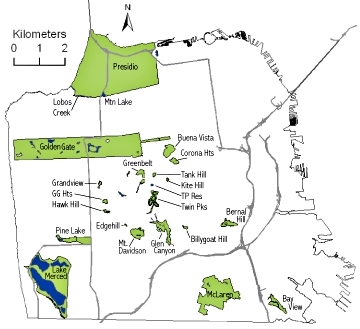 An interesting example from our study is Pine Lake park, where we recorded all four bat species. 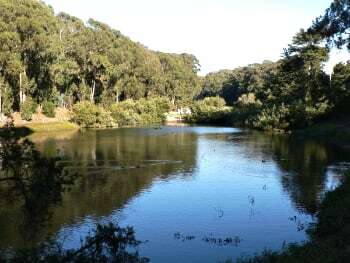 This medium-sized park includes a large non-native Eucalyptus and pine forest around a popular lake (see photo). Note our study did not examine bat roosting needs, but Pine Lake does have a lot of large trees, which are preferred by Yuma bats. 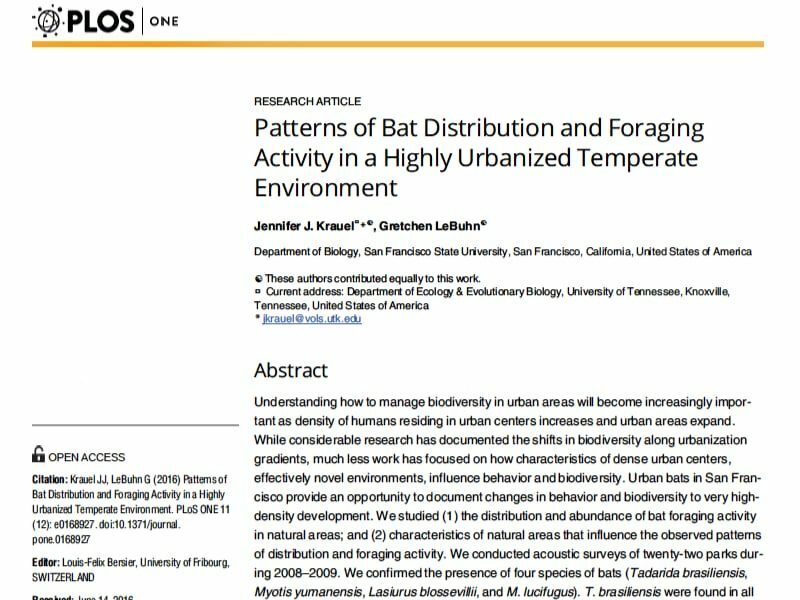 Our results provide useful information for those interested in maintaining bat diversity in increasingly urbanized areas. While it may not be easy to add lakes to parks, this study shows the importance of maintaining lakes in as many natural areas as possible. Maintaining clumps of trees, even if forests are not possible, is also important. Relatively modest efforts may do a lot to promote biodiversity in our future cities. For more details, download the published open access study (pdf). You can also read more about my experiences working on this project on my old blog.